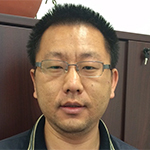 Hanyu Liu joins EFree as a Postdoctoral Associate. He is working with Russell Hemley and Ivan Naumov on carrying out theoretical and computational studies in support of the Novel Transport in Hydrogen Rich Materials project. He is also interested in studying the properties of materials at extreme conditions using molecular dynamics and crystal structure predictions. Hanyu comes to Carnegie from the University of Saskatchewan, where he was a Postdoctoral Fellow. He received his Ph.D. from Jilin University in 2013.